Uvarovite Mineral Specimen Dimensions: 1.3" x 0.7" x 0.6"
This natural specimen of uvarovite garnet druze on matrix was discovered at the Saranovskiy Mine, Russia. The tiny green garnet crystals have intense color and dodecahedral form. They have very brilliant vitreous luster. 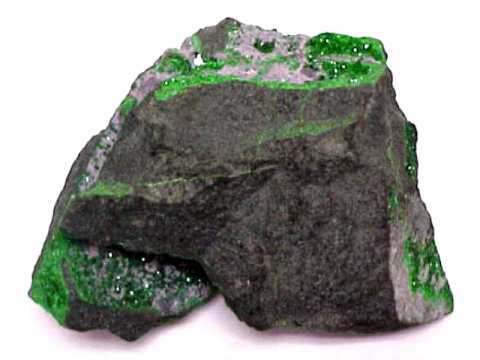 Uvarovite Mineral Specimen Dimensions: 1.5" x 1.0" x 0.6"
This natural specimen of uvarovite garnet druze on matrix was discovered at the Saranovskiy Mine, Russia. The tiny green garnet crystals have intense color and dodecahedral form. They have brilliant vitreous luster and measure up to 1mm across. 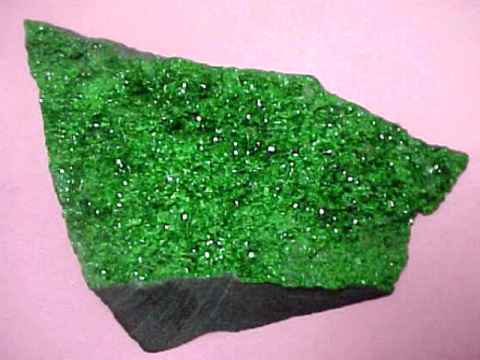 Uvarovite Mineral Specimen Dimensions: 1.1" x 0.8" x 0.5"
This natural specimen of uvarovite garnet druze on matrix was discovered at the Saranovskiy Mine, Russia. The tiny green garnet crystals have intense color and dodecahedral form. They have brilliant vitreous luster and are on both the front and back sides of this specimen. Uvarovite Mineral Specimen Dimensions: 2.2" x 0.8" x 0.7"
Uvarovite Mineral Specimen Dimensions: 1.9" x 1.7" x 0.7"
This natural specimen of uvarovite garnet druze on matrix was discovered at the Saranovskiy Mine, Russia. The tiny green garnet crystals have intense color and dodecahedral form. They have very brilliant vitreous luster and measure up to 1.5mm across. Uvarovite Garnet on Matirx Dimensions: 2.8" x 2.4" x 0.7"
Uvarovite Mineral Specimen Dimensions: 3" x 1.5" x 0.9"
This natural specimen of uvarovite garnet on matrix was discovered at the Saranovskiy Mine, Russia. The garnet crystals have intense green color and dodecahedral form. They measure up to 2.5mm in diameter! See also a full- view. Uvarovite Mineral Specimen Dimensions: 4.1" x 2.4" x 0.9"
This natural specimen of uvarovite garnet druze on matrix was discovered at the Saranovskiy Mine, Russia. The tiny green garnet crystals have intense color and dodecahedral form. They have a brilliant vitreous luster and measure up to 2.5mm in diameter! See also a full-view photo. Uvarovite Mineral Specimen Dimensions: 3.2" x 2.4" x 0.9"
This natural specimen of uvarovite garnet druze on matrix was discovered at the Saranovskiy Mine, Russia. The tiny green garnet crystals have intense color and dodecahedral form. They have a brilliant vitreous luster and measure up to 2mm in diameter! 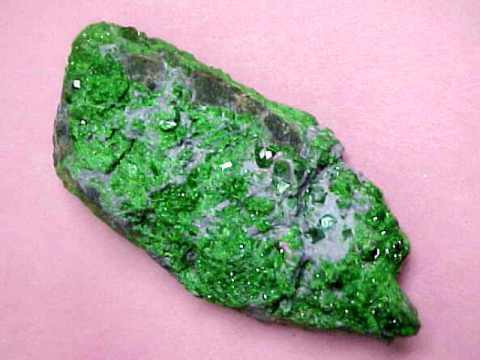 Uvarovite Mineral Specimen Dimensions: 3.8" x 2.5" x 1.4"
This natural specimen of uvarovite garnet druze on matrix was discovered at the Saranovskiy Mine, Russia. The tiny green garnet crystals have intense color and dodecahedral form. They have a very brilliant vitreous luster and measure up to 1mm across. 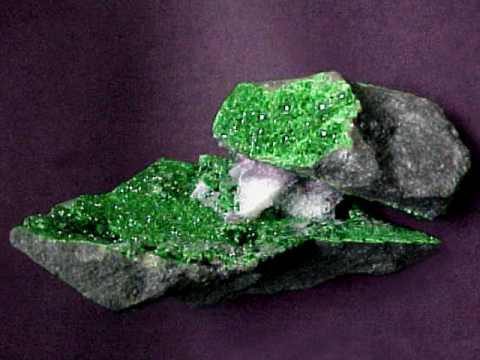 Uvarovite Garnet on Matrix Specimen Dimensions: 4.1" x 2.3" x 0.6"
This natural specimen of uvarovite garnet druze on matrix was discovered at the Saranovskiy Mine, Russia. The tiny green garnet crystals have intense color and dodecahedral form. They have a very brilliant vitreous luster and measure up to 2mm across. Uvarovite Garnet Specimen Size: 4.5" x 3" x 0.7"
This natural specimen of uvarovite garnet druze on matrix was discovered at the Saranovskiy Mine, Russia. This specimen was sawn to remove excess matrix. The tiny green garnet crystals have intense color and dodecahedral form. They have brilliant vitreous luster and measure up to 1.5mm in diameter. See also a full-view photo. Uvarovite Garnet Specimen Size: 4.4" x 4.3" x 2.8"
This natural specimen of uvarovite garnet druze on matrix was discovered at the Saranovskiy Mine, Russia. The tiny green garnet crystals have intense color and dodecahedral form. They have very brilliant vitreous luster and measure up to 1mm across. See also a side-view photo and a back-view photo. This is the end of our Uvarovite Garnet Lapidary Rough virtual gallery page. To see more uvarovite garnet photos, just select another item category from the table below. To see photos of another mineral variety, select any item category link in our Mineral Inventory & Factsheet Index. Would you like us to inform you when we add more natural uvarovite garnet lapidary rough on this page? 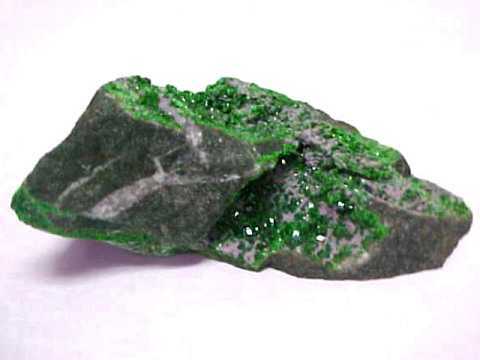 We do have a limited inventory of natural uvarovite garnet items in stock, so be sure to let us know if you have any special requests. Please contact our webmaster or our 'site' geologist with any questions or comments.